This week our local PhunkyFoods Engagement & Development Coordinator (EDC), Georgina, led an Eatwell workshop at Guestling Bradshaw CE Primary School in Hastings. 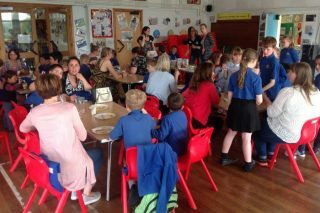 There was a fantastic turn-out of over 20 parents and carers, and after a 30 minute discussion on the Eatwell Guide, the children joined their families for a fabulous Cook and Eat session; making a delicious tomato, olive and tuna couscous and a fruity Supercrunch desert. 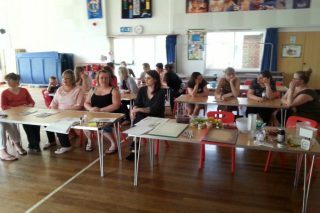 Headteacher Nathan Cline noted afterwards the ‘great attendance’ and ‘real positive feel’ which we were delighted to hear, and it was also lovely to hear parents saying how much they enjoyed cooking with their kids. We’re glad the session was such a success and it just goes to show how much enjoyment parents and children can get out of learning and producing something together – keep up the great work guys!